Hats off to Uncharted 4: A Thief's End developer Naughty Dog. Not only have they created a critical and commercial smash hit, that is widely being referred to as one of the finest games ever made, but they have taken pro-active steps to ensure that their farewell to Nathan Drake can be enjoyed by as many people as possible. Specifically, we're talking accessibility features. In a rather sweet and honest video released by Sony last week, a number of the Naughty Dog development team recount the story of how they brought accessibility features - that were partially implemented for The Last Of Us - to Uncharted 4, following a fan's revelation that he simply could not complete Uncharted 2 without the assistance of an able-bodied person, to help him get past a series of button-mashing door openings in the final chapters. That fan, incidentally, is Josh Straub. Josh is the editor-in-chief of the incredibly informative website DAGER System, that not only reviews games on whether they're any good, but also whether they present any specific challenges for players with disabilities. While a huge amount of credit is due to Naughty Dog, who have gone to such lengths to ensure improved accessibility for their game - and I'm not wanting to take anything away from their achievement, believe me - there is something quietly perverse about the situation. We find ourselves heaping praise upon a developer for going the extra mile in the sphere of accessibility in games, that in most other industries would be considered the bare minimum. Let's take rail travel as an example. If you want to travel by train, you'll find that every inch of that journey has been accounted for in terms of accessibility: there will be ramps or flat-level access to the station; you'll find ramps or elevators to avoid the use of stairs; low-height ticket machines will be available for wheelchair users; signs will carry Braille and kiosks will have text-to-speech facilities; ramps can be unfurled to bridge the gap between platform and train, and priority seating (or wheelchair space) will be available in the carriage. Rail travel is a very perfunctory activity, though, whose primary concern is getting people from A to B. Gaming on the other hand is purely for entertainment purposes, so it could logically follow that accessibility to transit is deemed more essential or important than entertainment. In the recreation space modern movie theatres all have step-free access, and the movies displayed will often have the option of subtitled screenings or even audio descriptions for the blind; while sports stadia and concert halls have specific seating and wheelchair areas for disabled patrons, to ensure they have as good a view of the action as everyone else. Since 1 October 2002 - Service providers have had to make 'reasonable adjustments' for disabled people, such as providing extra help or making changes to the way they provide their services. Since 1 October 2004 - Service providers may have to make other 'reasonable adjustments' in relation to the physical features of their premises to overcome physical barriers to access. And in this context Naughty Dog and Sony Interactive Entertainment - like the rail companies and the movie theatres - are service providers. They produce a product or service and you hand over some of your hard-earned cash to make use of, and hopefully enjoy, said product. While they're not obliged to make sure you like their product, they are required to make 'reasonable adjustments' to allow less physically able gamers to at least have the same access to their titles as everyone else. It's even worse if you do love their game - like Straub did, with Uncharted 2 - and are unable to complete it because accessibility in gaming is sadly streets behind almost every other industry. What is on the face of it an overwhelmingly positive intervention by Naughty Dog perhaps only seems like such an astounding leap forward, in terms of equality and accessibility, when considered against the backdrop of an industry that has been passive to the point of non-consideration when it comes to these issues. One of the Naughty Dog developers in Sony's accessibility video, UI scripter Andres Ortiz, speaks of how difficult he personally found the Uncharted series multiplayer to play, given that the teams have always been red and green and he suffers from classic red/green colour-blindness. He pitched the idea of changing the green team to blue, which is a small change that makes no difference to the gameplay itself, yet has allowed for Uncharted 4's multiplayer to be far more accessible. Sometimes it's a simple thing that makes all the difference. 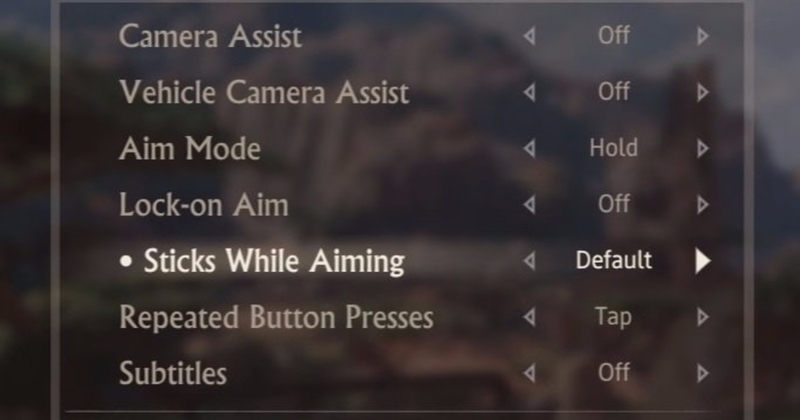 To be fair to the games industry for a moment, subtitling and remappable controls are relatively commonplace, and colour-blindness is one of the most widely-addressed accessibility issues - with everything from MOBAs and card games, through to strategy titles and that interminable hacking minigame from BioShock 2 causing red/green bother - but it's remarkable that even the most forward-thinking developer like Naughty Dog didn't realise they had a problem with multiplayer colours until a colour-blind developer joined their team in 2014, or with accessibility in general until a fan raised it as a red flag. That's not to say that all areas of accessibility in videogames are being neglected, however. There is a growing market for audio games - ostensibly games for the blind, which seems like a bonkers notion in a medium with the word 'video' in its name - that are growing in number and quality each year. Many take the format of an adventure game guided by narration, rather like a choose-your-own-adventure book or a classic text-based adventure like Zork, with the player making choices as to their character's progress. The likes of Sean Bean and Benedict Cumberbatch have lent their vocal talents to audio games in recent years too, which only helps raise their profile and bring them towards the mainstream. Audio games are becoming increasingly sophisticated, including elements like puzzles and combat - something which seems untenable without the aid of a visual display - but it's the quality of the audio cues and the improvements to the overall production values that make all the difference. There could be a tendency to err on the side of horror, given that a lack of sight makes for a terrifying prospect for those of us who have never experienced it, but it is important that audio games don't swap one sort of exclusivity for another. It would be wrong to doubly punish visually-impaired gamers with horror-only titles, and similarly, it would reduce the potential accessibility of these games for sighted players - whether through sheer idle curiosity, or because they are worthy games in their own right - by boiling down the lack of vision to a petrifying and lonely experience. Accessibility works both ways in this respect and audio RPG Three Monkeys sets out to avoid these pitfalls by actively empowering the player's blindness. In a world suddenly plunged into darkness the player character - blind from birth - is thrust into a position of power; the only person equipped with the skills to save the world, and the only person not afraid of the onset of darkness. Not only is Three Monkeys an exciting prospect as a videogame in its own right and a paragon of accessibility, it actively turns the notion of disability as weakness on its head, and offers a sense of both power and agency to a long-neglected community of potential gamers. And if you're left in any doubt as to why that's important I'll leave you with the words of Josh Straub, on why the accessibility features in Uncharted 4 are such a big deal. "When I turn on a game like Uncharted, I'm not, you know, confined to a wheelchair... that brief period of escape is why accessibility is so crucial, because the more games that offer that, the more people with disabilities will be able to escape and have better lives." Nice article, however the legal analysis isn't quite right. It's this it that's the problem - "They produce a product or service". You can't conflate products with services, they're very distinct things in the eyes of the equality act. If you buy a kettle, the person selling it is not allowed to refuse to sell it to you or charge you more for it, and must make reasonable adjustments to make sure you're not put at an unreasonable disadvantage while trying to buy it. But the kettle itself is not required to be accessible in any way. Same with games, developers are not legally required to make reasonable adjustments (although the moral, artistic and financial motivations should be enough without that). There is technically a requirement about in-app purchases, but that's never been legally tested. There is game-specific legislation in the USA however, relating solely to the communication functionality, which must be accessible to all (e.g. offering both text and voice), on the basis that commutation is a fundamental right, and games are an important communication device that can have a huge impact on people's ability to take part in society. There are fines of $100k/day for non-compliance, unless you're a company with less than 30 employees, or you can demonstrate that it's not reasonably possible to do it. Games consoles and gameplay / distribution networks (e.g. Steam) are both covered, with every new release / major update after October 2015 required to comply. Games themselves are also covered, but have a waiver until January 2017 before having to comply. Also Three Monkeys was canned over a year ago after their kickstarter failed to reach its target, but there are other nice recent examples - such as Mortal Kombat X and Killer Instinct, both of which dedicated dev time to ensuring their gameplay is fully accessible to people who are completely blind. Thanks for the info, Ian. I didn't know anything about that subject! How are movies treated in this case? When one buys a movie ticket, is it a product or a service? I take it from Tom Baines' comment above that you are not disabled, I say that because of your comment regarding rail travel. On paper, and in an ideal world, we would expect your comment above to be correct, in reality though for many disabled people it's actually very far from the truth. I've got a disabled leg from a training accident in 2007,so compared to some this is not as severe, yet I can't travel by rail because it's not safe for me as a disabled person to do so incase of injury or accident. Maybe rail travel is not the best example of how disability rights are supposed to work and help disabled people in the U.K.
We all know how obsessed GI.Biz is with Sony and to my knowledge this is something like the third article on this game since it's release. That aside, It's good that disabled gamers are finally getting press time for a change, and if you truly are interested in helping disabled gamers or highlighting the issues we have when gaming and not just writing articles to fuel the ps4 hype train then you may also want to take a look at what's been happening to help gamers with disabilities long before ND decided to add support. Such as Special Effect Charity here in the UK and Evil Controllers in the U.S who work to help disabled gamers, and who actively support the able gamers charity. I look forward to reading your articles on charities such as these who do a great job helping disabled people, and also in the name of fairness an article on how the Kinect has helped both disabled people in gaming as well as medical science, and also how Bill Gates was credited for the colour blind mode which helps a lot of gamers ;) ..
Daniel - the people making the movie don't have equality act obligations, but the people showing the movie do. Then there's TV broadcasting, which is a separate thing again. So again the TV production company has no obligations, but the broadcaster does (and they in turn pass requirements back to the production companies making their content, not too differently to console cert requirements). But the broadcasters' requirements aren't set by law, they're set by OFCOM, who are the TV industry's regulatory body. The TV industry successfully made the case that as they already police themselves very effectively, there's no need for legislation on top of that. So they have a specific exemption from the equality act. It would be great if the games industry could be in that situation. For when the inevitable time comes that legislators look at games again, for us to be able to say that we already know what's possible and what's not and already do a great job of doing all that's reasonably achievable.. rather than come up short and have regulations forced on the industry by people who won't necessarily have the best understanding of how gamedev works. Pete - Web would probably have been a better example to use than rail, it's certainly closer in terms of interactions and barriers. Web accessibility again like rail a is by no means perfect, but it is pretty much impossible to find a developer who isn't at least to some degree familiar with accessibility, it is taught as standard in degree courses, there are globally recognised and applied standards and guidelines, the big companies all employ accessibility specialists.. While all of these things are starting to happen in gamedev, none are anywhere near to the extend of web. This year's GDC broke all previous records for accessibility, the six or so accessibility related talks were attended by an average of 120 people per session. By comparison, at the same time as GDC but a bit further down the coast in San Diego is CSUN, an accessibility conference attended by thousands of web accessibility professionals. Lots of people have been working on game accessibility for a long time, pretty much since the first ever video games were made. There has been a great deal of progress, in the past few years in particular... It was only 2014 that implementing a colourblind mode was worthy of front page news. I don't think the point of the article is to detract from any of that progress, any of those people, or to heap praise on Sony and Naughty Dog. Quite the opposite, it's saying that the attention that Uncharted has recieved is a clear sign that we aren't yet where we need to be, that we shouldn't be in a position where it is seen as praiseworthy, we should be in a position where it is simply status quo. That's a sentiment shared by both Sony / Naughty Dog. They put out a longer 45 minute video as part of global accessibility awareness day in which they said pretty clearly that they don't view accessibility in the context of this one game, their biggest hope is that others will copy and improve upon their efforts, and continue to push the industry more towards where it should be.